The game of trend-spotting at big-ticket art fairs has always been mostly about playing the numbers. What's selling, and to whom? But at this year's FIAC in Paris, amid the high-rolling and the splashy frontrunners, I began looking for a genre that refuses to stay moribund: classical painting, and specifically realist painting inspired or informed by the techniques of early masters. Since hearing John Currin speak passionately and knowledgeably about pre-18th century paintings, at a Frieze London talk last month, I've begun tracking where such archaic activity may be found in contemporary work -- an often sublime respite from the lazily digital, the verbosely conceptual, the crudely sculptural, the defiantly abstract. Good old-fashioned painting chops, but assisted by the latest technologies of visual capture and manipulation, and immersed in compelling 21st century urban realities. The Three Graces (2012), by Kehinde Wiley. Inset: The Three Graces (1504), by Raphael. At FIAC, this year hosting 184 galleries from 25 countries, as always in the exquisite Industrial Age colossus Le Grand Palais (and satellite locations like the Jardin des Tuileries and the Jardin des Plantes), I found four artists who paint with a classical hand, and do it with both admirable skill and transcendent purpose. Two were actually showing at "off" fairs parallel with FIAC -- SLICK in a tent down along the Seine, and YIA (Young International Artists) over in the primary Paris gallery district, the Marais. Guillaume Bresson is a young painter who ingests the pictorial geometries of artists like Caravaggio and deploys them to comment obliquely on the often violent multicultural milieu of his own upbringing in a Paris suburb. Till Rabus was actually more inspired by modern hyperrealist masters like James Rosenquist, and the rude bric-a-brac-bedecked works of Sarah Lucas, one of the much-fêted Young British Artist of the 1990s, to create strange, finely rendered still-lifes made of found detribus. 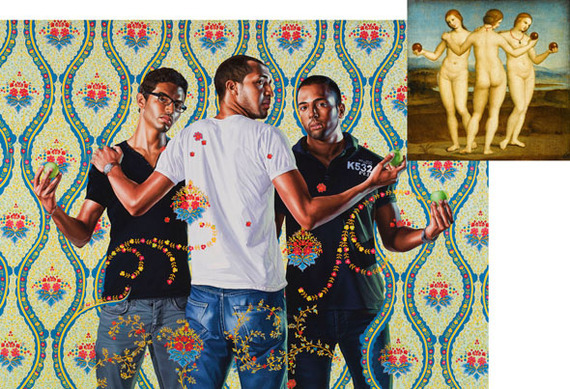 Kehinde Wiley travels around the world, lately Africa and the Middle East, to find young dispossessed men to pose in lofty tableaux that echo those of historical maestros such as Ingres, Raphael and Van Dyke. And Dan Witz is a New York street artist who uses the urban canvas to disseminate meticulously painted images of anonymous prisoners (working often with Amnesty International), of women peering into their cel phones (again, taking lighting cues from Caravaggio), of hummingbirds flitting delicately atop or near Manhattan's coarser graffiti. They all have in common a fastidious devotion to claiming the illusionistic powers of earlier painters, recipes all but lost in current art-school kitchens. I interviewed the gallerists about their respective artists in the following videos.